Thanks for your patience, Bay Area readers. The blog posts will soon be flowing like you’ve come to expect, because after a competitive search, we’re pleased to announce that Roger Rudick is the new editor of Streetsblog San Francisco. 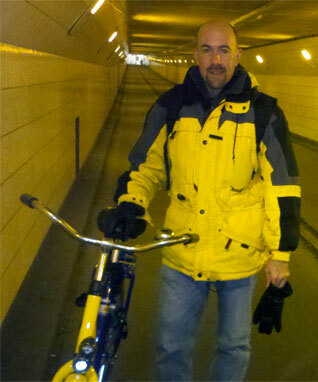 Roger poses in the bike tunnel under the Maas River in Rotterdam. Roger is an experienced transportation journalist and activist who’s impressed us with his deep understanding of policy, lifelong commitment to better transit and safer streets, and superb writing. As a reporter and producer, his transit coverage has appeared in the New York Times, PBS, and NPR. He’s filed dispatches on bike infrastructure from Rotterdam to Vancouver. And we’ve published his freelance work on Streetsblog USA, Streetsblog LA, and Streetsblog SF. Roger currently splits his time between his home in LA and San Francisco, where he has worked as a freelance producer for KQED radio and TV. We are going to make the transition to his full-time stewardship over the course of the next few weeks, as he handles a permanent move to the Bay Area. During this interim period, Streetsblog SF will be updated regularly, with headline aggregation in the mornings and multiple original posts per week. We expect to reach full frequency, with daily original content in addition to headlines, in January. We’re also going to be making a management transition, with Streetsblog SF moving from the organizational umbrella of OpenPlans, the nonprofit that publishes Streetsblog NYC and Streetsblog USA, to the California Streets Initiative, the nonprofit that publishes Streetsblog LA and Streetsblog California. We believe this switch will be advantageous for the day-to-day management of Streetsblog SF and allow for tighter coordination between all the California-based Streetsblog sites. We’re excited about these changes and the future of Streetsblog SF. With the SFMTA starting to get into the swing of nimble street redesigns, the upcoming citywide expansion of Bay Area Bike Share, and the ongoing roll out of Muni Forward, the opportunity to transform San Francisco’s streets is as great as ever. The whole Bay Area is grappling with questions of how to handle surging growth while improving transit access, street safety, and housing affordability. Streetsblog SF has a major role to play in making the case for smart public policy to address these issues, and we’re thrilled to be working with Roger on this coverage. As always, reader support is indispensable to Streetsblog SF. Reader contributions have kept the site going for several years now, and we’ll be starting up a pledge drive to give the site a solid financial footing in 2016. (You can give right now!) With your generous support, Streetsblog SF will be an influential voice for safer streets and effective transit in the Bay Area for years to come. Ben Fried heads up OpenPlans and Damien Newton is the director of the California Streets Initiative. Welcome Roger and good luck ! So will Roger keep foisting wacky electrification ideas on the San Francisco readers? Seriously, best wishes for the new position. Exciting news! Very much looking forward to getting more frequent in-depth coverage of local complete streets news in the Bay Area again. Is this a sly reference to the Raker Act of 1919 or something else? Any case, glad to see that SBSF is not going away, and hopefully it can grow from here. It would be great to see more reporting on the SFBC thing. I know Roger and can attest to his authenticity and commitment to progressive and intelligent transportation issues. Congrats Roger. Roger is a fine individual, but in my conversation didn’t understand engineering, Title VI, or how financial analysis is done. Readers will need to look for the pro-electrification/pro-rail bias in his writing, even though bus rapid transit or protected bikeways may be the better solution for the situation. Woohoo. Great to have an editor again. Welcome Roger! Can’t wait to disagree with everything you write! I greatly enjoyed the peace and quiet while this blog was silent. But it will be fun to have a new editor to bother! Uh, upgrading the Orange Line to LRT and providing an EMU link between LAX and Union Station are both very sensible projects. There may well be other projects that should be higher priority (I don’t know enough about LA transit to make that judgement) but I think it’s rather unfair to characterize support for those projects as ‘wacky’. Congrats! Look forward to seeing the next generation of Streetsblog SF thrive under Roger. We assume Roger is going to be Roger….and that’s a good thing! Welcome Roger!. Hope you can offer some perspective on the difference between LA and the Bay Area (and hope you cover the parts of they Bay Area some forget about – like North Bay/Silicon Valley). I disagree. Although the ideas are not on the order of saying that chemtrails poison humans or that 9/11 was a government plot, in the case of Harbor Subdivision there are posts from Roger implying that planners intentionally conspired to hide the facts by not considering his hand-picked alternatives. Roger is tilting at windmills with his Orange Line idea and was thoroughly debunked by commenters on his post. Just read your article on Caltrain, Roger. Looking forward to more of your posts!